It has been a nervy time for the Arts Barn Gilbert and Sullivan Society, but their show will go ahead as planned. They will present one of the shorter operettas written by the duo entitled Trial by Jury at The Castle Theatre in Wellingborough after the venue was re-opened. This will be presented together with a selection of favourites from shows such as the Pirates of Penzance, The Gondoliers, Iolanthe, The Sorcerer and Patience. 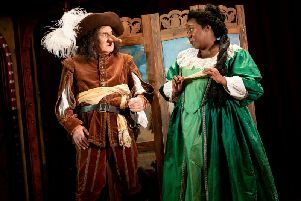 The plot follows the hilarious court room proceedings in a case of a ‘breach of promise of marriage’, with the usual satire and wit employed by Gilbert and Sullivan to ridicule the establishment and the legal system. The show takes place from Wednesday November 2 to Saturday November 5. The shows start at 7.45pm each evening and a matinee performance on the Saturday starting at 2.30pm. Tickets, which cost £10, and £5 for students, with a special price of £8 on Wednesday evening and the Saturday matinée. They are available from the Castle Theatre by calling the box office on 01933 270007 or by visiting www.castletheatre.co.uk.